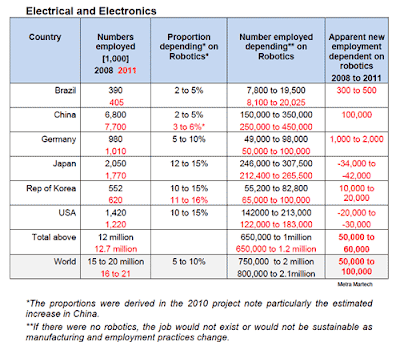 Do industrial robots really have a positive impact on employment? 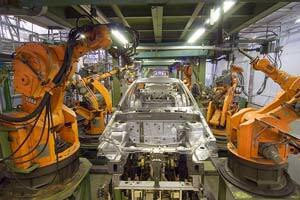 Do industrial robots really have a positive impact on employment? Of course they do and there are over 50 years of data proving that to be the case. There are at least 350,000 people directly employed by and in the industrial robotics industry. However, industrial robots are not made in the US; they are made in Japan, Korea and Europe, consequently more than half of those 350,000 jobs are offshore. There are ancillary providers of components, software and other services for robots and installations but these jobs are hard to quantify. In general manufacturing there are known multipliers, but in robotics there is no known formula to extrapolate just how many jobs in these ancillary businesses are attributable to robotics. The deployment of robots into a factory situation involves even more complex computations and assumptions — which is why the International Federation of Robotics (IFR) commissioned the UK-based research firm Metra Martech in 2009 to figure out how to compute the effect on jobs of the deployment of industrial robots. The IFR annually collects, reports on shipments and sales, computes robots at work (versus idle or abandoned), and makes five-year sales and deployment projections of industrial and service robots worldwide. They summarize their data into two comprehensive books: World Robotics Industrial Robots 2012 and World Robotics Service Robots 2012 reflecting data for 2011. The 2013 books covering 2012 data will be available later this year. Metra Martech’s original report was delivered in February, 2011. It concluded that they had determined a job-creation ratio of 3.6 jobs for every robot deployed, and that with more robots, fewer jobs are lost. 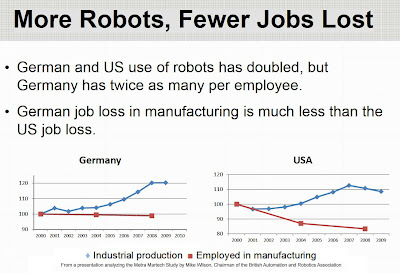 That’s why Germany, with hourly rates almost 50% higher than in the US, has remained globally competitive: they have twice as many robots per 10,000 workers as do Americans. Their research claimed that 3 million jobs were created in factories where accuracy and consistency could not be achieved without robots, and another 300,000 jobs were created where poor working conditions were overcome by the use of robots. Much has happened during and since 2008, the unfortunate base year for that report, which is why the IFR re-commissioned Metra Martech in 2012 to update their findings for more recent data. Robotics is a critical factor in rebalancing world manufacturing economies because it reduces the threat from low-cost-of-labor countries. Although the recession temporarily drew attention away from unsatisfactory work conditions, enhancing work conditions is a driving force for using robots. Replacing dull, dirty and dangerous tasks with robots is the low-hanging fruit of robotics. There are many new industries where only robots can produce precision and consistency standards at an affordable cost as demanded by the competitive global economy. Downstream jobs (.9 to 1.4 million). Americans are living through a confusing economic period. They see things in “home economics” terms: job creation is up but nowhere near covering population growth; unemployment has dipped slightly but hides the broader unemployment rate; stock markets are reaching new highs; and house prices and disposable income are both rising. Yet public sentiment is focused on jobs and job creation, and for good reason: millions have fallen off the employment grid and the employment figures don’t reflect the true numbers nor the hardships this has caused. Hence the concern about jobs being taken away: about being left behind, about off-shoring, robots, relocation, acquisition, closures, consolidation or otherwise. Part of the complexity of the Metra Martech report is that it must take into account the economic, population, industry variables and downstream multipliers unique to each of the main countries in the study. For example, manufacturing accounts for only 11% of employment in the US, but 24% in Germany and 27% in South Korea. “While it is clear that robots can and do replace unskilled, dirty or dangerous occupations, there are two main drivers for added employment resulting from the use of robots. The first is the need to use the repeatability and accuracy which they can provide. Note that this is evident throughout the world no matter what local labour costs. Source: Metra Martech, 2013, “Potential NEW activity jobs because of robotics 2012 to 2020, pg 10. Although they don’t really address statistically what happens to displaced workers, they do say that they are often kept, retrained, and utilized in upscale jobs created as a result of the efficiencies reaped from the new robots. But they don’t provide any numbers or formulas to support this thesis. The updated report moves away from a strict focus on industrial robotics, suggesting that SMEs and healthcare/medical robotics will show broad job growth in the next few years. Thus 21% to 24% of Metra Martech’s potential new jobs projections include service robots marketing and manufacturing. They rationalize this contradiction by saying that service robots can be likened to consumer products and therefore will need new manufacturing requiring robotics. Offsets for jobs displaced, although frequently mentioned in the report, could not be measured with the data available. Downstream jobs include (1) employment in ancillary businesses that are needed to support robot construction, robotic installations, robot control, and (2) jobs created by adding well-paid robotics industry employees into the community. Metra Martech suggests a third group to be (3) other types of jobs in support of the use of the products manufactured where the products can only be produced by robots. In manufacturing, an industry statistic to reflect downstream ancillary jobs is 1.3 jobs in a support business for every new job in manufacturing. This multiplier effect is frequently validated in general manufacturing. 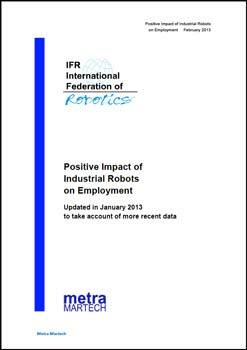 But applying that figure in the robotics industry is difficult because it relates to jobs, whereas the Metra Martech projections apply to robots deployed predicated on the data provided by the IFR. Nowhere in their report is there a correlation of the number of jobs replaced by a single robot; thus a true downstream jobs figure cannot be tabulated. Consequently, I find the Metra Martech report somewhat flawed but not for lack of trying. It was a noble effort and remains a valuable tool showing that the robotics industry really does create jobs.